✅ Instant Expansion: 5-in-1 USB C Hub equipped with 2*USB 3.0, HDMI 4K port, Micro SD/TF card reader slot, SD card slot. 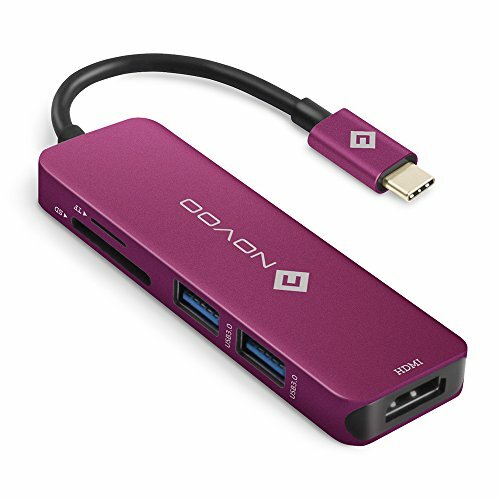 Easily expand usb c devices and fulfill your daily use. ✅ Easily access files from SD and TF card readers. COMPATIBLE with all new MacBook/MacBook Pro with USB-C ports, DELL XPS15, HP Spectre X360, Google Chromebook Pixel, Lenovo Yoga 900 / 910, Samsung Tablet, Microsoft 910, Huawei Matebook, HP Elite x 2 1012, DELL XPS13-93, ASUS ZENBOOK 3, HP TPN-Q178, Samsung Galaxy S8, S8+, LG G5 G6, Lumia 950 and many more. ✅ Buy with maximum confidence: CE, FCC and RoHS certified, our device has stable output, temperature protection, anti-over current and anti-short circuit - not to mention that it is backed by a 12-month guarantee as well. USB C Hub worked well in single Hotel wall port. Really handy all in one.